This is my second entry to "medieval architecture detail" in CCCX. The town hall was first intended to be a part of a larger MOC depicting the architecture of Bruges. However, when I finisheded building the tower I decided to make it a bit bigger to present it as a separate creation. I tried to keep the construction in a typical style of Belgian architecture, especially this of the town halls all over the country. So I found all the tourist guides and albums about Belgium I had at home (by the way, surprisingly many of them ) and tried to get grasp of some characteristic details. What helped me the most as the inspiration were the town halls of Oudenaarde, Brussels and Leuven, and Antwerp cathedral. It's amazing to think that something this incredible and detailed all fits on a 16x16 baseplate. That's a 16x16 base plate? I didn't see that until Justin M pointed it out. I love the details and flowers. Dude, when I first saw this picture I thought this build was huge! I'm so impressed with the amount of detail here. Yeah I had no idea this was microscale until I saw what category you built it for. Great job and amazing details. Good luck in the CCCX! 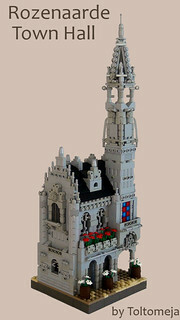 AK_Brickster wrote: Yeah I had no idea this was microscale until I saw what category you built it for. Great job and amazing details. Good luck in the CCCX! Oh come on, guys! Have you really got used to the fact that my MOCs alre always microscale? I'll surprise you this time: not all of them are and surely not this one. Although comparing Rozenaarde to the actual buildings it's slightly smaller than minifig, I think it's still not a microscale. Rather... Dwarves scale maybe? Or children scale? I never thought it possible to include so much realistic detail on one small MOC. You've proved me wrong, great work! Basically all I'm going to say will be an echo of the other guys... but the detail and skill that you fit into every little nook and cranny is amazing!